Imagine yourself on a long voyage towards Venice. Perhaps you are a merchant headed into Venice to sell your goods in the thriving market. Or maybe you are an artist, on your way to study the art and architecture. March 2014, single image, additional exposures for highlights, focal length 155mm, aperture f/11, shutter speed 1 second, ISO 100, tripod. 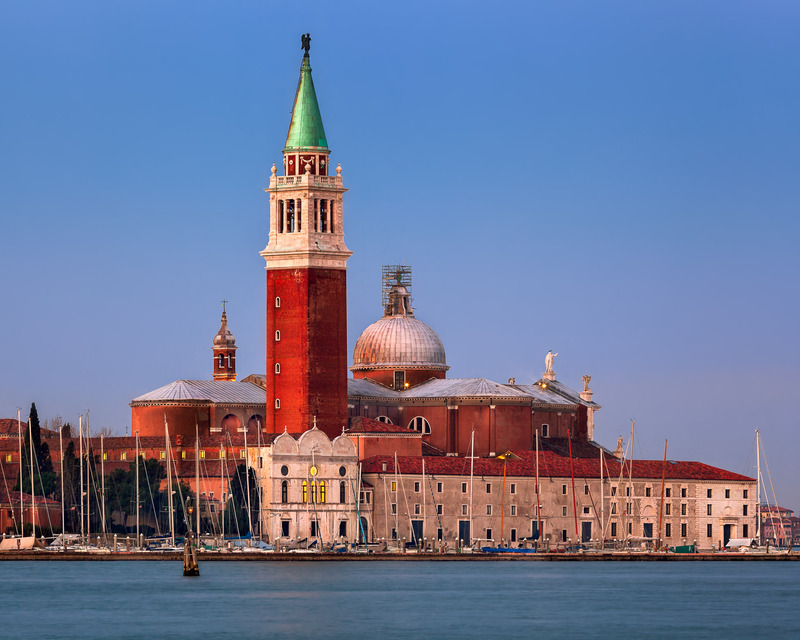 Whatever your reason for heading to this destination, when approaching Venice see the island bound church in this photo, the San Giorgio Maggiore, is one of the first things you see before arriving in Venice. After shooting Campanile and Doge’s Palace with telephoto lens earlier this morning, I decided to try long focus composition with San Giorgio Maggiore Church from the very same spot. During this shoot I made a series of photos capturing different phases of twilight. The sun expected to rise behind my back and provided excellent side lighting which rendered the architecture details in a stunning way. To narrow down which photo to showcase I selected the one with the best light and colour quality.